Don’t you get tired of eating the same thing over and over again?!?! I do. I love vegetables, but I find myself at loss at finding fun vegetable recipes. Summer offers a large array of vegetables ( corn, tomatoes, peppers, zucchini, summer squash), but I am always cooking them the same way, roasted, or in salads. So it is always nice to find a new recipe that allows you to cook some of those vegetables in a way that is foreign to you. 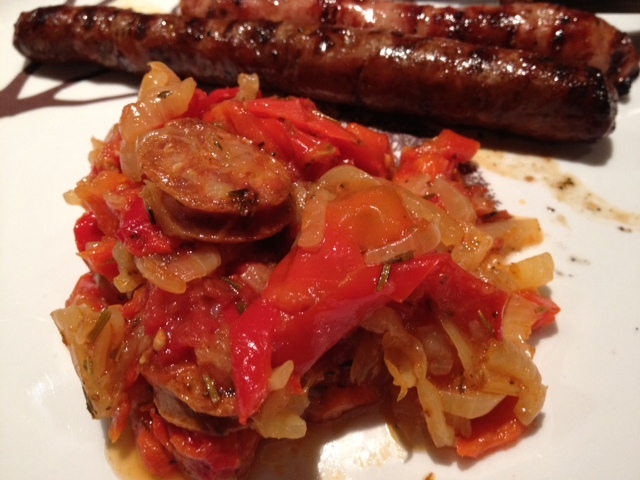 As I was visiting my twin sister, she introduced me to a vegetable dish that she called ” La peperonata”. 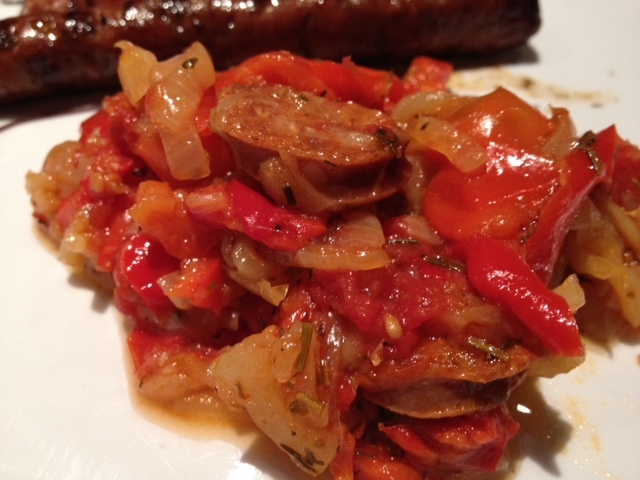 Originally la peperonata is a vegetable stew made of tomatoes, peppers and onions. But my sister made it different as she added peperoni to hers, and this was so so good. Ingredients for 6-8: 2-3 tbsp of olive oil, 1/2 bag of sliced pepperoni, 2 lbs of roma tomatoes rinsed and quartered, 2 lbs of sweet yellow onions sliced thinly, 2 lbs of red peppers cored and sliced in thin strips, 1 clove of garlic peeled and crushed, 1 tbsp of italian seasoning, 1/2 tsp of salt, 1/4 tsp of pepper. In a large pot, warm up the olive oil and heat it up over a medium-high heat. When the oil is warm, add the onions and the pepperoni to the pan and saute them. Saute until the onions are golden and translucent. Add the sliced peppers and saute them also for a few minutes. Add the chopped tomatoes, the salt, the pepper and the italian seasoning and bring it all to boil. Be careful to stir so that it will not scorch. Lower the temperature to low, cover the pan with a lid and cook for 30 minutes. Make sure to stir periodically to prevent scorching. Add more salt, and pepper if you deem necessary. If it was up to my husband and my children, they would eat Spaghetti a la Bolognese or Spaghetti Carbonara every time I wanted to fix pastas. But today I did not listen to their wishes. I had some Gorgonzola in the fridge and decided it would be the dressing for todays’ pasta. 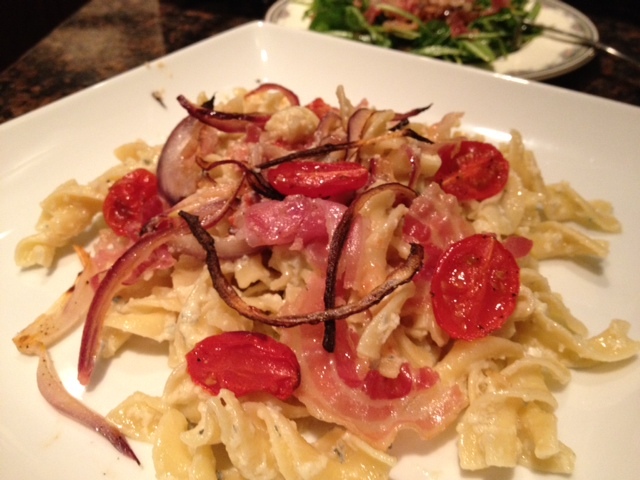 Ingredients: 1/4 purple onions sliced thinly, 1 cup of baby tomatoes sliced in half, 1 pack of fettuccine, 2 tbsp of butter, 1 cup of heavy cream, 1/3 cup of gorgonzola crumbled, 1/4 cup of pancetta very thinly sliced, 1 egg, salt and pepper, olive oil. 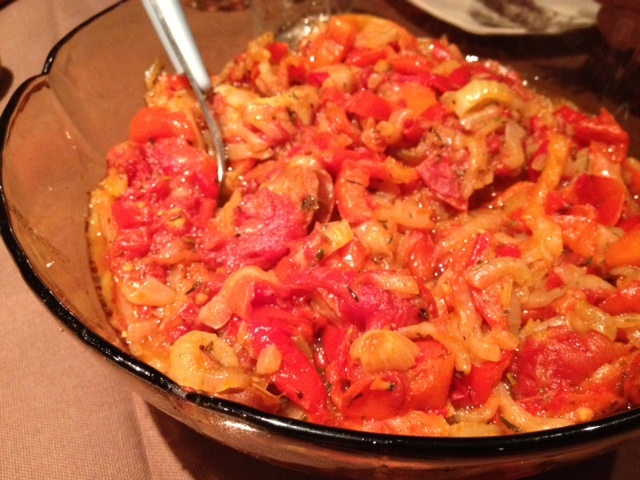 Place the sliced onions and the halved tomatoes in a large bowl, add 1 tsp of olive oil and mix to coat the vegetables. Spread the vegetables on the silpat that you would have previously placed on a perforated sheet. Sprinkle the vegetables with salt and pepper. 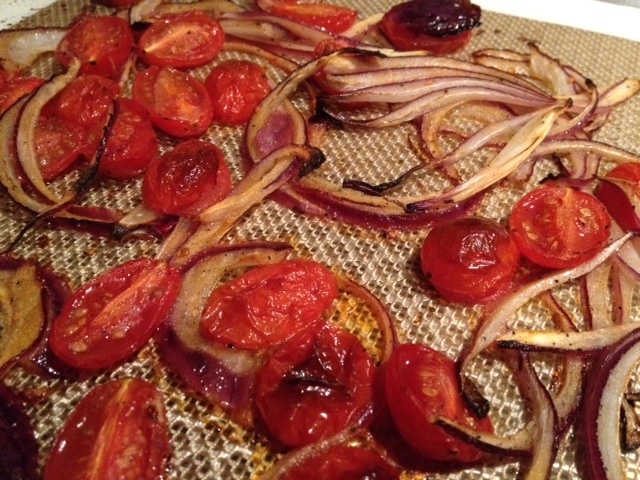 Roast the tomatoes and onions for 8-10 minutes at 375. 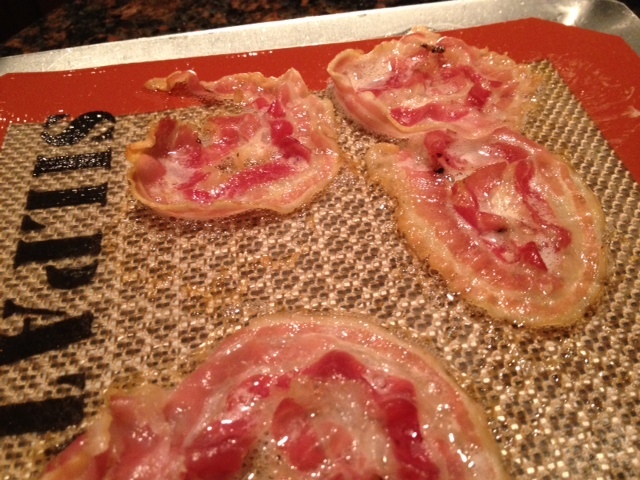 Place the pancetta on a silpat as well and roast it too for 8-10 minutes. It will become crisp. While the vegetables are cooking, cook the pasta according to package directions. And while this is cooking, prepare the gorgonzola sauce. In a small saucepan, melt the butter and when it is starting to sizzle, add the warm heavy cream. Stir, and turn the heat down to medium-low. Add the crumbled Gorgonzola, a dash of salt and pepper and stir while cooking until the gorgonzola is completly melted. Add 1 egg and mix well at a low temperature until the sauce is getting thicker. Set aside. Drain the pasta, and add the sauce to the pasta. Mix well. Add the roasted vegetables and mix again. 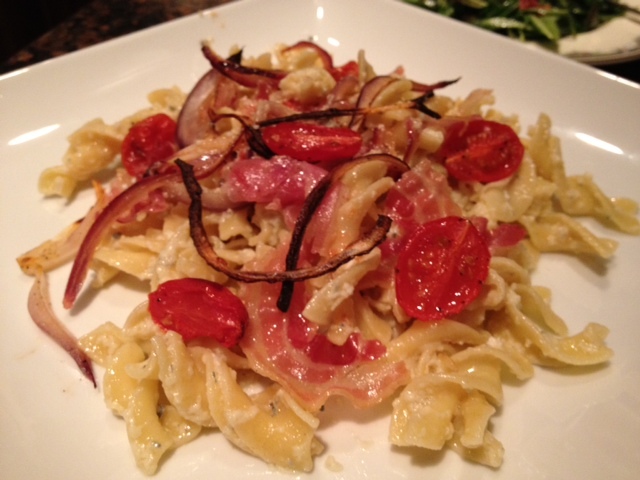 Spoon the pasta on each plate and crumble the pancetta on top of the pasta. And serve with garlic bread and arugula salad. Et voila!! !